Bannister Lake, provider of professional broadcast data aggregation and visualization solutions, has announced that its Chameleon data aggregation and management software played an integral role in delivering editorial and graphic content for the FIA-Certified Gran Turismo Championships 2018 Series. The tournament has quickly become one of the world's most popular eSports events featuring the best Gran Turismo drivers. Chameleon was used during the championships run-ups in Salzburg, Madrid, and Las Vegas leading up to the world finals in Monaco that took place Nov. 16-18. In all, the tournament covered four international regions over a three-month period, ultimately reducing the field of hundreds of contestants down to 30 finalists. In partnership with Montreal's The Boombox Group, Bannister Lake provided the event's data management solution populating graphics both in-venue and for the tournament's web broadcasts. Chameleon was used to filter data coming from Google Sheets and organize data for each of the competition's races. Chameleon also provided the event with tournament standings based on points and finish position and its BLADE RESTful API was used to reformat data content to make it readily available to graphics engines for display. Bannister Lake has worked on numerous eSports and high-profile sporting events including the recent FIFA eWorld Cup™ 2018 and the 2018 US Open Tennis Championships. Both events used Chameleon to aggregate a wide variety of data content, moderate and manage content, and distribute it to various output channels. 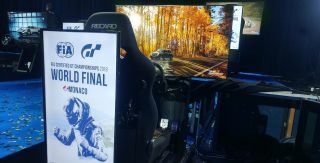 "The FIA-Certified Gran Turismo Championships had its own unique challenges, but we were able to take full advantage of our production experience," said Al Savoie, Bannister Lake's technical and creative director who supervised data graphics integration onsite. "A great example of this is our ability to trigger specific graphics directly from the switcher to sync driver cameras, with their corresponding lower thirds. This gave the technical director the ability to go to three boxes at any time and have the correct name, flag, and manufacture of each of the drivers." Bannister Lake's Chameleon has quickly become a popular choice for eSports production, providing a more engaging experience for fans while creating new revenue opportunities for event organizers. By aggregating and displaying multiple real-time data sources, it enables fans to receive added editorial information while allowing sponsors to generate more impressions.